There is no hope of bailing out of a speedboat. You hit the water and become so much pulp. Hurry boys, hurry, we have to make a quick change or the hour will be up. The news comes somewhat late, but I’m glad to hear it nevertheless. Malcolm Campbell was an English racing motorist and motoring journalist. He gained the world speed record on land and on water at various times during the 1920s and 1930s using vehicles called Blue Bird. 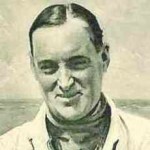 His son, Donald Campbell, carried on the family tradition by holding both land speed and water speed records.